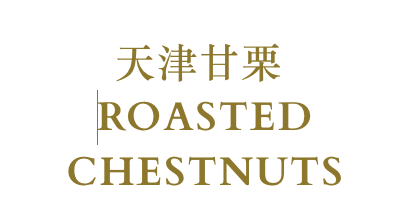 Roasted chestnuts are great as a snack, but can also be de-shelled and used in both savory and sweet recipes. Recipes shared by our customers have included traditional turkey stuffing, soups, stews, and even ice cream! Here are a few of our favorites below. Combine onion, carrot, and oil in a bowl and toss to coat the vegetables. Put ingredients on oven pan and bake for 1 hour or until tender, stirring occasionally. Add chestnuts; stir in chicken broth. Pour broth mixture into a blender; blend until smooth. Pour pureed mixture into a Dutch oven. Stir in 1/2 teaspoon salt and pepper. Place the pot over medium-high heat; bring to a simmer. Reduce heat and simmer 20 minutes. Place cream into a medium bowl; beat with a mixer at high speed until soft peaks form. Add remaining 1/8 teaspoon salt; beat at high speed until stiff peaks form (do not overbeat). Ladle about 3/4 cup soup into each of 10 bowls; Sprinkle with thyme. Serve immediately. Bring chicken broth and Sherry to boil in medium saucepan over high heat. Reduce heat to low; cover and keep warm. Meanwhile, heat oil and 2 tablespoons butter in heavy large saucepan over medium heat. Add onion and squash; cook until onion is translucent, stirring often, about 10 minutes. Add rice; stir until rice is translucent at edges but still opaque in center, about 3 minutes. Add 1 cup warm broth; simmer until almost absorbed, stirring often, about 4 minutes. Add more broth, 1 cup at a time, allowing each addition to be absorbed before adding next until rice is just tender, stirring frequently, about 25 minutes total. Stir in chestnuts, thyme, and marjoram. Remove from heat; stir in remaining 1 tablespoon butter, cheese, and parsley. Season risotto with salt and pepper and serve. Melt butter in a large saucepan, add garlic, bacon and leek and fry for 3 minutes until leek is soft. Add chestnuts, potato, chicken stock and thyme. Bring to the boil, reduce heat and cover the pan; simmer for 35 minutes or until chestnuts are tender. Remove pan from heat and puree soup, in batches, in a food processor or blender. Reheat soup, mix in 2 tablespoons sour cream and the brandy. Season to taste, and serve in bowls, topped with a spoonful of sour cream and sprinkled with chives. For pasta, sift flour into a mixing bowl or food processor, add basil, garlic and eggs, and mix to a smooth dough. Knead by hand for 5 minutes, or if using processor, for 1 minute. Roll dough through a pasta machine, then cut into either fettuccine or spaghetti. Lay out flat on a lightly floured work surface while preparing the sauce. For sauce, fry chestnuts in butter over low heat, until golden brown. Add onion, green onion and ham and fry for 2 minutes over moderate heat. Stir in cream and simmer for 3 minutes or until slightly thickened. Add parsley and cheese, stirring until cheese has melted. Season to taste with freshly ground black pepper. Meanwhile, cook pasta in saucepan of boiling salted water for 5 minutes or until al dente. Drain and serve immediately with the sauce on top.